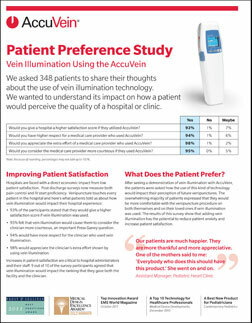 We recently asked a large group of patients to share their thoughts about the use of vein illumination technology. We wanted to understand its impact on how a patient would perceive the quality of a hospital or clinic. Patient satisfaction is a key measurement of success. Learn what patients said about Improving Patient Satisfaction. After seeing a demonstration of vein illumination patients were asked how this new technology would impact their choices of healthcare provider. Read What Does The Patient Prefer? It’s all well and good for a patient to express a preference, but will it affect their behavior? Read about vein illumination’s Impact On Patient Choice. Vein illumination is emerging as part of the standard of care in many facilities. Learn about the impact on the Standard Of Care. We all see patients that talk about previous trouble with venipuncture. Learn about patients who have had Previous Trouble With Venipuncture. And finally, does the use of vein illumination have an Impact On Blood Donation. Want a copy of the satisfaction survey? Simply fill out this form and one of our vein illumination specialists will call you!